At Zugligeti 'Niche' Camping in Budapest (Budapest) camping costs as little as €18,- per night during low season with CampingCard ACSI. At one of the 90 touring pitches you will get a discounted rate during the period 01-01-2019 - 15-04-2019, 25-04-2019 - 15-07-2019 and 01-09-2019 - 25-12-2019. At this campsite you can not only use your CampingCard ACSI for inexpensive camping, you can also use your ACSI Club ID (as an alternative ID). Idyllically situated three star campsite, good toilet facilities. Bus to the centre every 20 minutes. An ideal base for visiting the city. CampingCard ACSI holders can buy an excellent breakfast for only 3 Euros each. Every year, traveling around Europe, we stop at this wonderful campsite. The historical place, nature and surroundings make it attractive. Perfect spot for convenience of visiting the city. very warm welcome, helpful and friendly at all times. Great breakfast selection. the toilet/showers were absolutely fine. Would recommend a stay here. Very interesting experience. Super, super hosts, offered us a free beer while completing check-in. Put local currency on our bill so we could at least get to downtown on the bus, which conveniently stopped close to the campsite. Very easy directions given to the city. Free Hungarian breakfast each morning, very nice! Small, shady pitches. Goodish wi-fi at the bar/reception area. Bathrooms adequate but really in need of an update, rustic would best describe it, and for the price! But the hospitality certainly made us overlook this technicality. Beware though... Night two a coach load of teenagers arrived and 25 odd tents were pitched next to us! The teenagers were very well behaved and quiet but the bathrooms could not endure this many people. Question this? On the plus side, we did question our host on this and during check-out we were given a free bottle of wine. So all in all we came away happy, these hosts understand customer service. For convenience to Budapest you couldn't go wrong. A simply brilliant site for exploring Budapest using public transport. Its a unique setting and with investment in the shower/toilet facilities - it could become a top rated site. Excellent value for money, very welcoming and helpful family running the place. Did not eat on site so no comments there. The toilet and shower facilites would benefit from a substantial re-fit - but were clean at all times. internet nur in unmittelbarer nähe der rezeption/ restaurant (gratis). budapest zentrum mit bus 102 ( haltestelle 150m ) und dann tram 4 oder 6 nehmen. stadtplan und informationen wird von der eigentümerin mitgegeben. service ist gut. für die stadt zu besuchen ganz okay. The site has recently been chopped into 2 with the grass pitches now mostly under the name of Ave Natura. Niche is very organisied and reasonably maintained. Pitches are a little small with just enough room to take a 7m van but larger would be a problem. Most days we were there were sunny in the morning and cloudy in the afternoon. Showers were, therefore best in the afternoon as solar heating has been working all morning. In the morning the water isn't really hot enough... This is a good urban site from which to explore the city. The family-run atmosphere is excellent. Don't be afraid to negotiate on prices. We were made very welcome by Marta and her friendly team. The free breakfasts were good with a wide choice and there is a range of tasty supper dishes. Would you like to book Zugligeti 'Niche' Camping or request more information? You can do both using the information below. From Austria via the M1 or M7 from Balaton, exit 14 Budakeszi. From the M0, follow this road to the end then Route 1 direction Budakeszi. From Budakeszi follow camping signs. From the city; to Moszkva Ter then follow the camping signs. 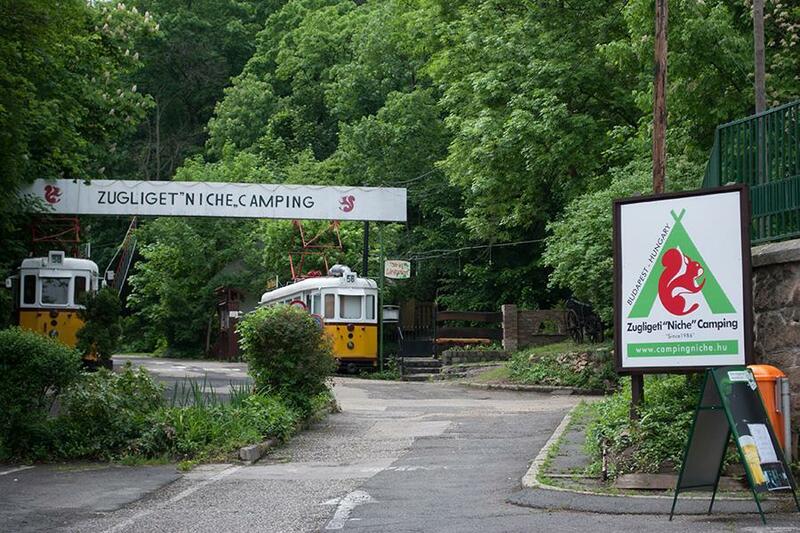 CampingCard ACSI will send your information request to "Zugligeti 'Niche' Camping".